The Trickster exists in different cultures around the globe: the wily shapeshifter with the power to transform the way we see the world. As an archetype, The Trickster can be found in any walk of life where people must operate according to more than one set of rules, moving seamlessly between the appearance of things and the underlying truth. Artists know this realm well for they are consigned to delve deep below the surface and manifest what they find. Yet their discoveries are not necessarily in line with the status quo; more often than not, they will upset polite society and upend respectability politics by speaking truth to power – quite literally. In the United States, African Americans know this well. Throughout the course of the nation’s history, they have been forced to deal with systemic oppression and abuse in a culture filled with double speak that began with the words “All men are created equal,” penned in the Declaration of Independence by Thomas Jefferson, a man who kept his own children as slaves until his death. Throughout his career, artist Kehinde Wiley has moved smoothly between spheres of influence, using the canon of Western art as a tool of subversion, celebration, and recognition for those who have long been excluded from the narrative. “History is written by the victors,” Winston Churchill said, reminding us that now is the time to reclaim that which belongs to us. In Trickster, a new exhibition of work currently on view at Sean Kelly, Gallery, through June 17, 2017, New York, Wiley honors his contemporaries who walk his same path, creating a series of portraits of extraordinary black artists including Derrick Adams, Sanford Biggers, Nick Cave, Rashid Johnson, Glenn Ligon, Kerry James Marshall, Wangechi Mutu, Yinka Shonibare, Mickalene Thomas, Hank Willis Thomas, Carrie Mae Weems, and Lynette Yiadom-Boakye. Using Francisco Goya’s infamous Black Paintings as the departure point, Wiley puts blackness front and centre, operating on several levels simultaneously. Below, he speaks to us about this work, revealing the power and courage it takes to go beyond the known. I love the title of the show. It’s both forthright and coy, like the Trickster themselves. What was the inspiration for this body of work? 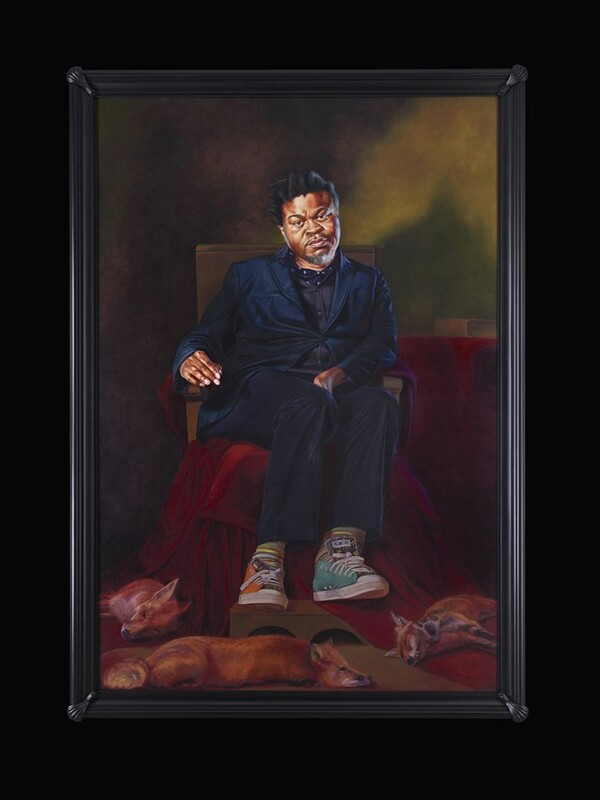 Kehinde Wiley: The title refers to a lateral move within my own art making. So much of the people and the story about my painting has been about nameless individuals who I run into in the streets of America and developing countries all over the world. Here I am dealing with relatively known, celebrated individuals who belong to an art tradition that prizes shapeshifting, that prizes originality, and looking at the Trickster as the way we see contemporary black American artists. The Trickster element points directly to the African-American tradition of using shapeshifting as a means of survival: in the ways that they speak, in the ways that they sing, this kind of coded language that begins in American chattel slavery like talking behind the master’s back and continues on into blues and jazz, and even arguably hip-hop culture, which is now being beamed out into the rest of the world. The necessity of code switching in the art world is intense. There’s something very powerful and subversive there, especially because you’re speaking in the language that’s known but at the same time, you’re addressing something that you know that a lot of people aren’t even conscious of. How does the creation of art allow you to speak to different audiences simultaneously? 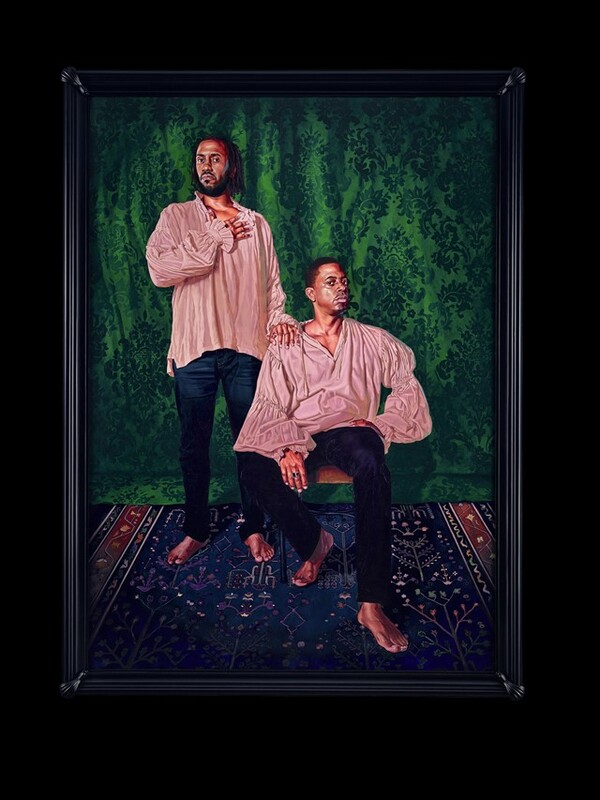 Kehinde Wiley: Code switching is directly on point. It’s a concern of mine that goes back to some of my earliest work, back to the first body of work that I created out of the Studio Museum in Harlem many years ago was entirely Passing/Posing. The idea in that body of work is that black masculinity is a kind of mask that is both fabricated and performed every day, that difference between what it feels like to be in a black American male body and that cognitive dissonance you feel when you’re looking at the caricature of it in popular culture and global media and how you both perform to it and fight against it as a thinker, as an artist, as a human being. 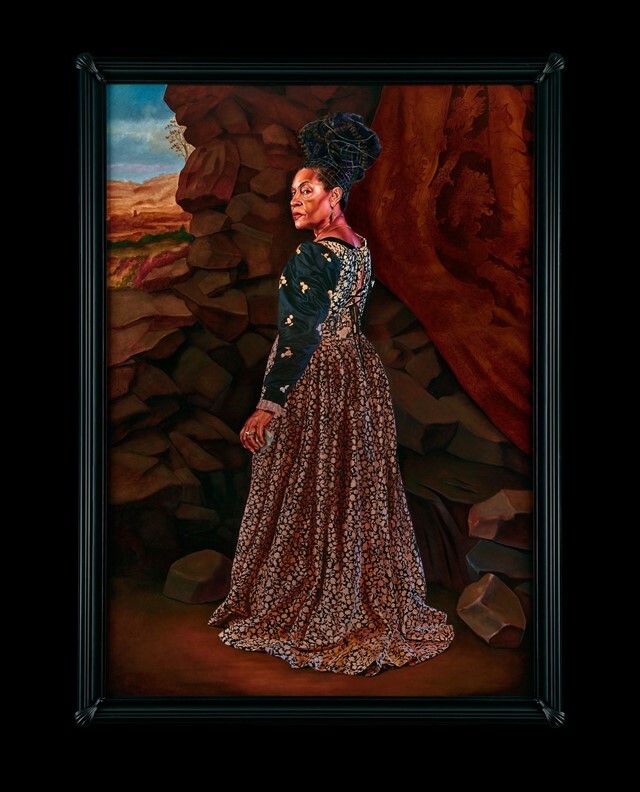 Much of the work that’s in this exhibition is in direct defiance to some of those perceived fixed selves that I’m talking about, but it’s also in celebration of the multiplicities of identities, all of those different characters, all of those different artists from Carrie Mae Weems to Wangechi Mutu to Mickalene Thomas. These are both heroes and friends. They’re both sparring partners and voices of adulation and confidence. It’s a very vulnerable show in the sense of that so much of what an artist tries to do is separate himself from his peers. What I’ve tried to do here is to draw a line of continuity and community around my peers and tried to use the language of heraldry and dignity to carve out a sacred space which functions as both sacred and profane. How did the process of having them sit for you deepen your knowledge of them? Kehinde Wiley: One of the great things about this show is that it’s some of the purest portraiture that you rarely see in contemporary art. It comes from the traditional sitting process, it’s painted in a way that’s centuries old. I was really trying to find that language and make it alive, and live in the 21st century. What we did was use 21st century tools such as digital photography and Photoshop, but it really does come back to having each of these artists come by my studio and spend an hour, two hours talking about how they want to be seen. I shot thousands of pictures. Once I shot the pictures, we would go in on Photoshop and find which head works with which body. It wasn’t just one shot, it was often times a combination of different things. One of the things that portraiture has in its history is this illusion that it tells you something about the sitter, that portraiture can elucidate something about the interior life of the individual and in modern times we are very suspicious of that. We are suspicious of that romantic notion of art being able to communicate anything deeper than the material surface and I disagree. I think that there is some aspect of conversation going on in the work. There is a reality to the collaboration that happens on that day and you see it in the walls and in those paintings when you see the exhibition. What is it about portraiture that resonates with you? Kehinde Wiley: It’s the ultimate subject matter. We just don’t resonate to a bowl of fruit or a landscape the same way we do when we peer into the eyes of another. I think what we haven’t done historically is make space for the “peripheral” voices. We haven’t seen people who happen to look like me in many of the great museums around the world and I think it’s an exciting time to polish off a language that is to some extent stale and discovered but to another extent has so many undiscovered features and contours by virtue of the absence of people who look like me within that narrative. What do you find to be the most satisfying aspect of redefining these codified boundaries of Western art? Kehinde Wiley: The most exciting part is being able to discover new things in the process of thinking about what the next show will be in terms of looking at art and having a lifestyle that enables me to constantly be in museum spaces and constantly look at the real world through the rubric of a creative process. It’s a way of being. It’s not simply a studio practice or the physical act of painting. It is a lifestyle choice that allows you to see possibilities not only in painting and the histories and narratives that exist there, but in the grace that you see in an everyday basis allows you to heighten or diminish certain features of actuality and allows them to be re-presented in such a way that life feels much more bearable and beautiful, full of verve. I don’t think it’s worthwhile to make the type of art that doesn’t turn you on, that doesn’t get you all wrapped up with fear and anxiety. This show was easily one of the hardest ones for me to create because of a lot of the issues that we were talking about, because of the anxieties of influence, a lot of the fears I had about how people would either understand or misunderstand this body of work. I think that’s the point. You’re really on to something when you don’t necessarily feel comfortable or confident with every move.